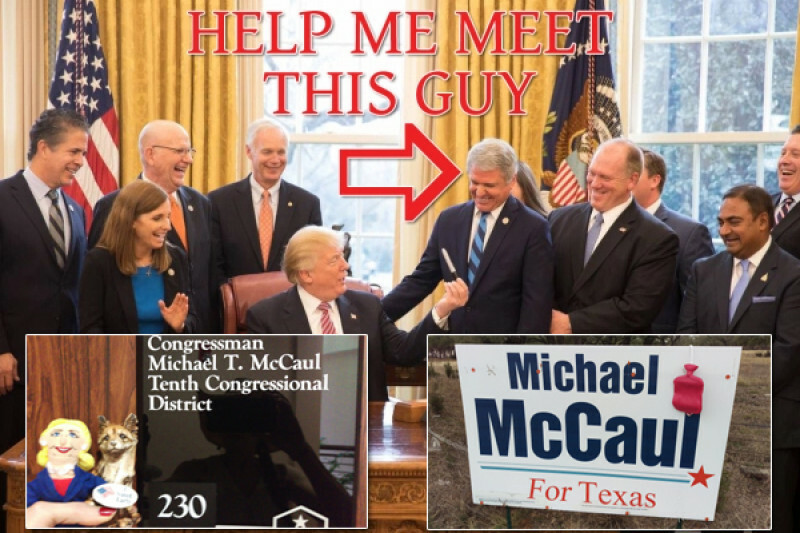 I keep trying to contact my "Representative," Michael McCaul, but he does not deign to make himself available to his lowly constituents. 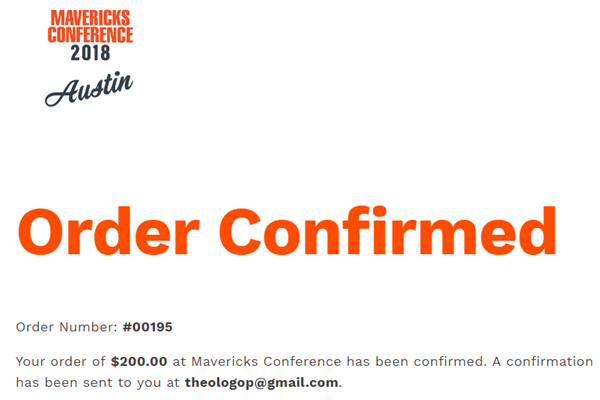 For $200, I can buy my way into Mavericks Conference 2018 in Austin on Friday, June 1. I intend to ask him a short 16-word question. (This is not my first rodeo. ). Please donate to my GoFundMe. I went to Michael McCaul's office today with members of Indivisible Rosedale Huddle and TX10 Indivisible - Discussion. There was a full room, and there were new faces. I came with three documents for him. I read the first one aloud in a calm voice, shaking the whole time. Was it nerves? Was it fury? Does it matter? Here is the first document, a letter. I have come here yet again, to speak with the staffers who serve as your impenetrable defense against enduring the presence of constituents like me. I've brought old prose and old poetry, printed out for you. I would appreciate a response from you that is specific to what I have written. I do not wish to receive a form-letter response from your staff. Send me something real - from you - or please send nothing at all. There was a time when I actually believed that if I could craft an elegant enough, eloquent enough, emotional enough communication, I could move you to feel the horror of our uniquely American gun violence blood bath, and respond with action. I no longer believe that I have what it takes to convince bad people to do good things. I am not a religious person, but I know that there is evil in this world... that villains exist. I have also been told that no one looks in the mirror and sees one. I am here, once again, to pretend that I give you the benefit of the doubt; and to act like I assume that you really don't know what role you have played and are playing on this earth. You most certainly are, but I sincerely believe that people can change, and therefore you can. Shake the scales from your eyes, Sir. Look around you, and listen. Millions of Americans - your fellow men and women, people you are pledged and honor-bound to serve - are suffering greatly and unnecessarily. We are wounded in body and mind. Millions of us have a story to tell you about how we got this way, and how you - year after year - add to our ever-growing number. We love our country, and by that, I mean we love its people. We don't believe that Americans are uniquely violent or evil, or the only ones who watch movies or listen to music or play video games or have the internet, or are the only ones who suffer mental illness or take medication to manage it. We don't believe that American children have improperly designed school buildings, or particularly incompetent or cowardly school resource officers or teachers or staff or parents. We believe that we can wake from our terrible national nightmare of gun violence by reforming our gun laws. It has happened elsewhere, in other countries, whose people are no better or worse than us, but whose leaders are demonstrably better than you. A moment of silence is a universal sign of respect for the fallen, whether in battle or in class. I gave that to the Santa Fe slaughtered with a broken heart. 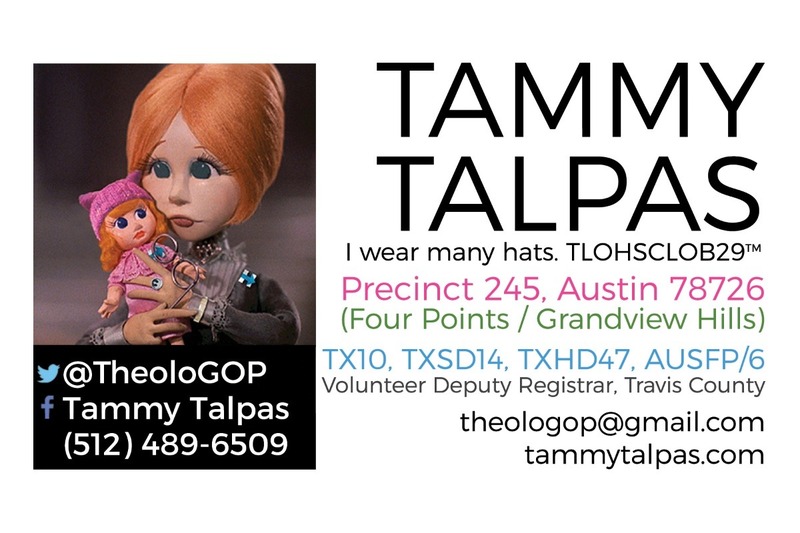 I plan to keep using my voice - the one you are willfully deaf to - to explain why I believe we are honor-bound as decent human beings to legislate gun reform. The two orange frocks from Amazon were on my Amazon WishList. Someone with Prime has ordered them for me, and they should be here in time for Friday. Parking at Brazos Hall and ACL Live at The Moody Theater looks like highway robbery, and the garages nearby are not much cheaper. They look like a street mugging. Lyft is a sponsor of the event. If they are providing free rides, I will park a ways away, and take advantage of that. MAKE SURE TO READ UPDATE 4. You all have made my holiday weekend. THANK YOU! Resist. Persist. Register Others. GOTV. 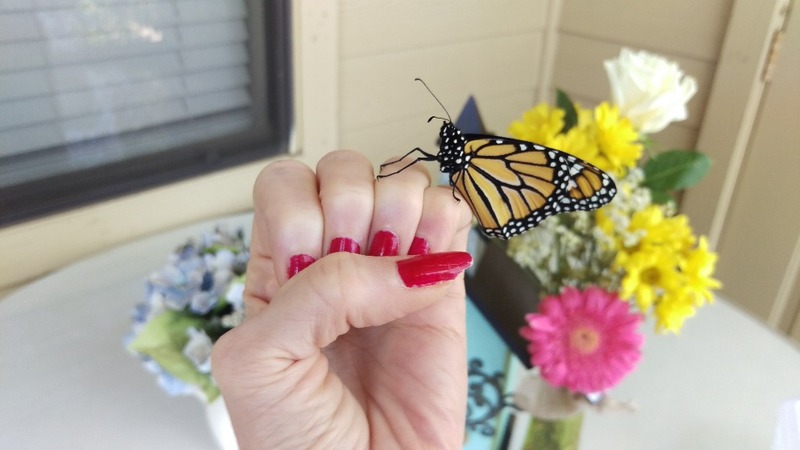 Thank you for helping me reach my initial goal. I have purchased my $200 ticket (see pic 1). Honestly, I hate going to these things and listening to these people. (I would rather have my nose hairs waxed.) 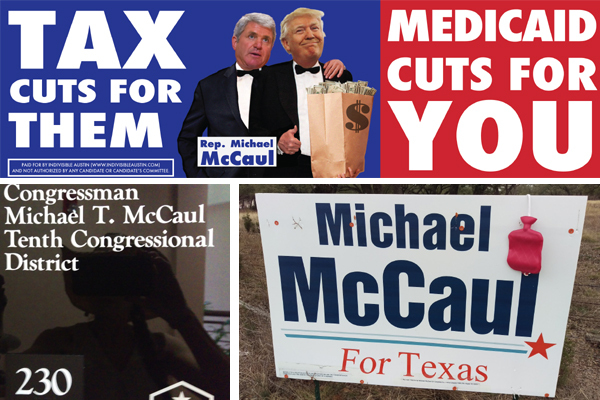 I have already committed the $50 already donated above my goal to Indivisible Austin's Anti-McCaul Billboard Fund (see pic 3), which would still leave them $1300 short. I am increasing my goal to $1600. Do I expect to get there? not really, but I didn't expect to get to $200, either. If I'm banned, I better get a refund! Billboard, me at his door, a douchebag.